My notes from Frontiers in Interaction in Milano, an italian event about user experience/interaction design that focused on the Internet of Things as well as Virtual Environments. Thanks Leandro Agro and Matteo Penzo for the invitation! Fabio Sergio: "designing for the segment of one"
Fabio described the cell phone as the "personal remote control for life", which is contradictory with the fact that cell phones have the same shell (hardware, physical appearance) and the same ghost (software). Obviously, this does not reflect the specific needs people have. At the same time, function fatigue is the number one complain of cell phone users (Source: forum to advance the mobile experience). As Don Norman said, "we want simplicity but we don't want to give up any of the cool futures", hence the myth of simplicity. Shell: hardware is hard but it's getting softer, as attested by some examples: Schulze&Webb' metal phone, rapid manufacturing by Patrick Jouin, "3D software for the masses" (see this announcement for that matter). According to him, a near future path would be the 3D printing of your own shell ("to match the color of your shoes" as Fabio put on the slide). A last example he showed is Panoko, an emergent marketplace for 3D printing. Ghost: there are some steps towards the direction of software personalization with Jaiku or MySocial Fabric or the advent of a widget-based model. Another important domain would also correspond to the "one field that rule them all" model: the google field search is indeed presented by Fabio as a relevant style of interaction (which claims is supported by a recent paper by Don Norman). There are already examples of this trend but ,as Fabio pointed out, it's still lacking "Magic". 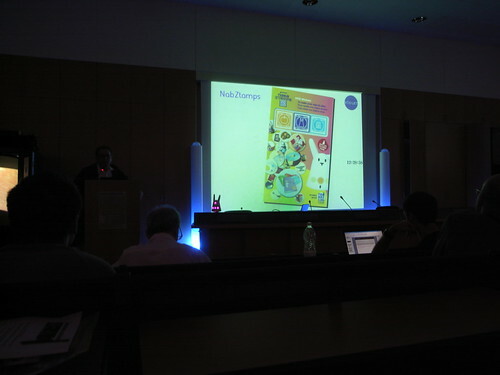 This talk was a worthwhile and compelling account of the Nabaztag creation. As a minitel and internet pioneer, he was convinced by the idea of ubiquitous computing, he and his team wondered about "how to get there from here" (a recurring question for people interested in the future ;) ). His point was that "there is life beyond CES". Deploying what he called a "teddy bear theory", they aimed at improving devices following the basic process: mechanical/functional (classic teddy bear or scale) to digital (singing teddy bear or enhanced scale) to connected. They had 3 ambitions with this project: - popularizing the idea that there is a life after the PC: the world is not reduced to a screen. - experimenting screenless ways to provide information (sound, light, movements but not in a "new age" way) - bringing virtual worlds to the real life: a physical avatar. The challenges were not so simple, the point was to start facing the real life challenges of ambient devices: how do you live with a screenless one button-device? how to face the complexity of un-interactiveness? how to manage serendipity? There were also important technical design challenges (local/networked). Moreover it was also challenging to see how existing information could be used. Rafi Haladjian highlighted the importance of bottom-up innovation in their project: as he said "we don't want to invent the life of people", therefore their approach was to to sell this connected rabbit and see what emerges: how would people invent the "Internet of Things"? (And people said "Wow" as he expressed). Violet's strategy is to empower people by making things they can play with. Jeffrey Schnapp I took less notes here but I was impressed by how he described successful innovation as a "tradition of productive failure, failed interaction and failed immersion", which he exemplified by virtual reality examples that aimed at replacing the physical. Another hint from him that I liked (and that resonated with my talk) was the aim of "replacing total immersion, total interaction and reality replacement paradigms with partial, distracted play-based paradigms that exploit and interconnect the specificities and experiential potentialities of physical and digital things". 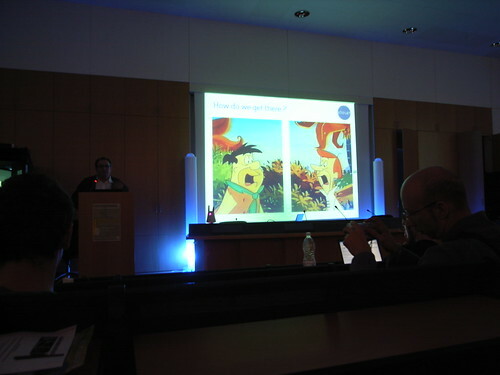 I was also interested in talks by Alexandro Valli (io agency), Teresa Colombi (LudoTIC, she presented an insightful study of eye-tracking device employed to analyse the UX of WoW) and Francesco Cara although they were in italian. Valli described three interesting ideas: - how "digital does not exist" but is only a form of representation, the digital being an enabler of possibilities. - the importance of being "cold" - simplicity as the ultimate sophistication (Leonardo da Vinci).